doi:10.4236/jbise.2010.34048 Published Online April 2010 (http://www.SciRP.org/journal/jbise/). 7Department of Radiation Oncology, University of Maryland, Baltimore, USA. Received 15 January 2010; revised 25 January 2010; accepted 30 January 2010.
lack of pathologic staging and/or less efficacious treatment. effective dose by decreasing treatment time. clinical disease (i.e. clinical target volume, CTV). dimension and 1 cm in the cranial caudal directions. technique to a total dose of 48 or 60 Gy in 8 fractions. morbidities and five refused surgery. sional CT (4DCT) simulation to generate an ITV. the hot spots in the surrounding normal tissue. sure no adverse events occurred. for these patient s un dergoin g SBRT. planned for accrual to this trial. recorded since the treatment started. characteristics of this cohort are described in Table 1. FEV1 = 1.25 L, mean DLCO = 50.8%). 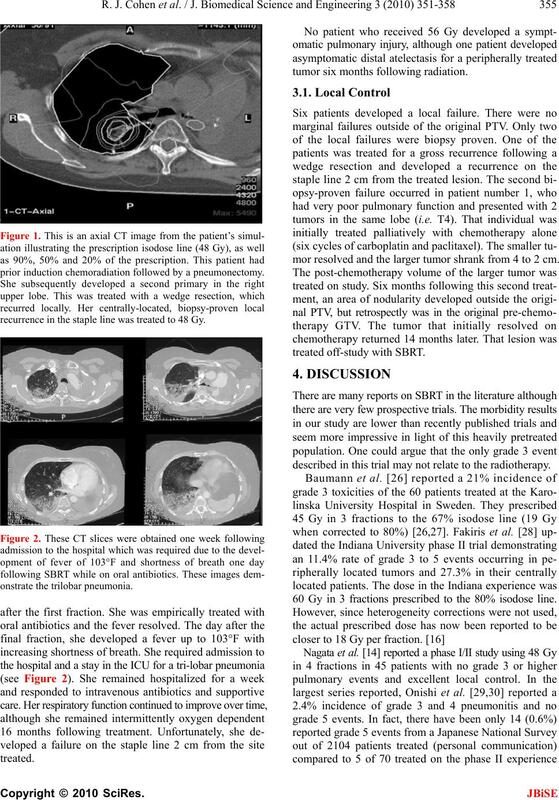 prior induction chemoradiation followed by a pneumonectomy. recurrence in the staple line was treated to 48 Gy. tumor six months following radiation. mor resolved and the larger tumor shrank from 4 to 2 cm. 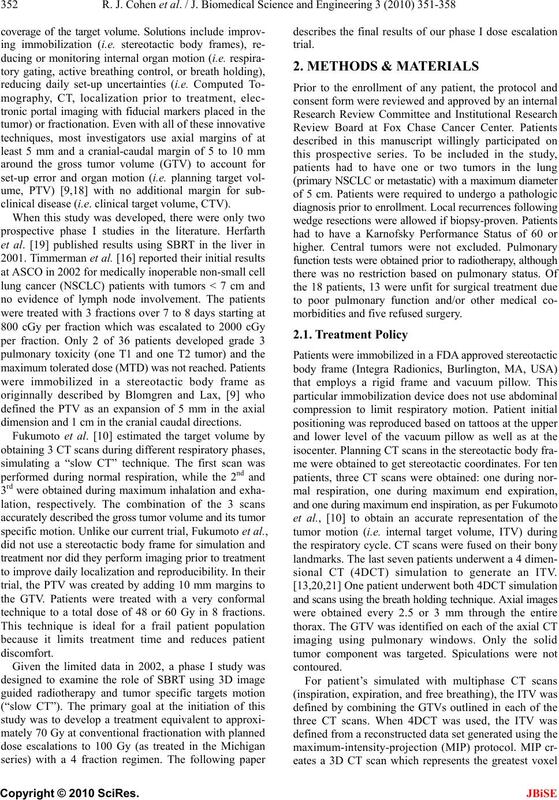 described in this trial may not relate to the radiotherapy. 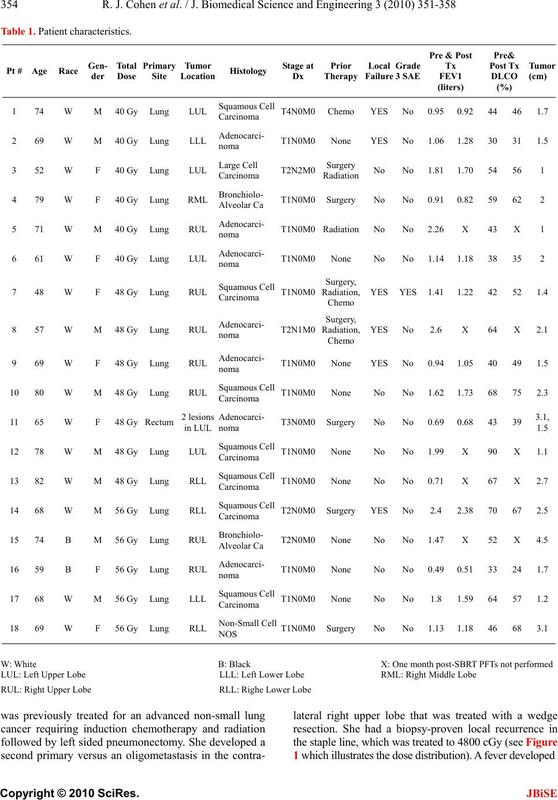 60 Gy in 3 fractions prescribed to the 80% isodose line. in peripheral lesions treated with 54-60 Gy in 3 fractions. developed rib fracture or chest wall pain. likely to increase with further follow-up. no brachial plexus injuries in our study. or post-chemotherapy sett i ng m ay be difficult to delineate. cult after either surgical intervention or chemotherapy. these areas of subclinical disease may increas e mor bid ity. fits of this treatment following prior treatment. Gy dose levels, which may be related to radiotherapy. system for staging lung cancer. Chest, 111, 1710-1717.
maki, R., Roa, W.H., Ryu, J.K., Bosch, W. and Emami, B.
diation Oncology Biology Physics, 61, 318-328.
cancer. 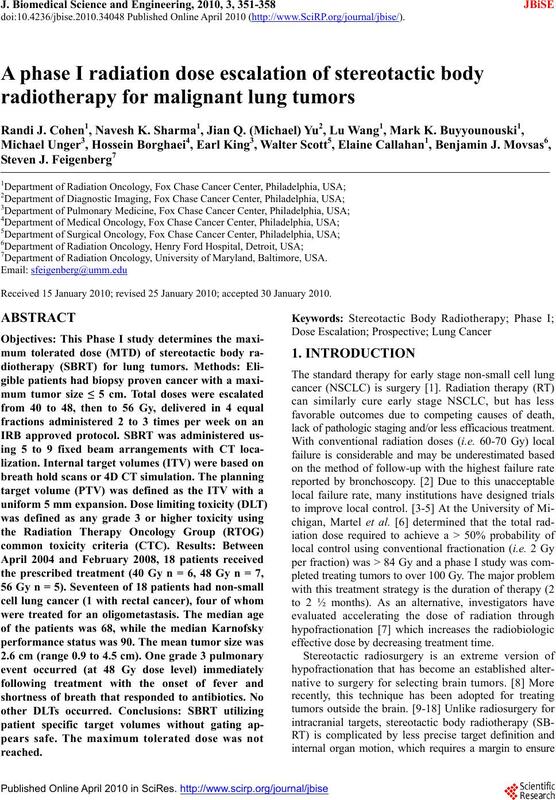 Lung Cancer, 44, 79-88.
son, A., Rusch, V., Kris, M.G., Ling, C.C. 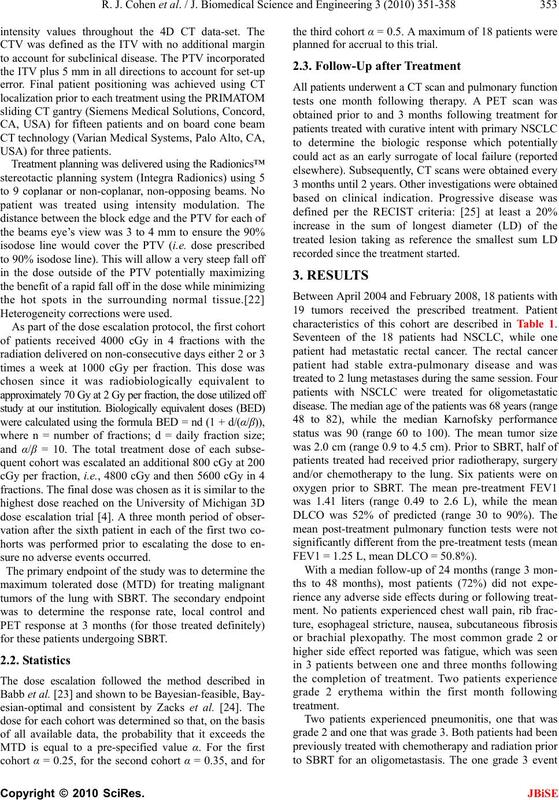 and Leibel, S.A.
phase III results of the RTOG 9508 randomised trial. Blomgren, H., Lax, I., Naslund, I. and Svanstrom, R.
with inoperable Stage I nonsmall cell lung carcinomas. Fuse, M., Shinohara, D., Nagaoka, T. and Kobiki, T.
of insertion of a gold marker using bronchofiberscopy. M., Shibuya, K., Araki, N., Yano, S. and Hiraoka, M.
moto, F., Tsumatori, G., Ozeki, Y., Aoki, T., Watanabe, M.
cology Biology Physics, 66, 738-747.
erage. 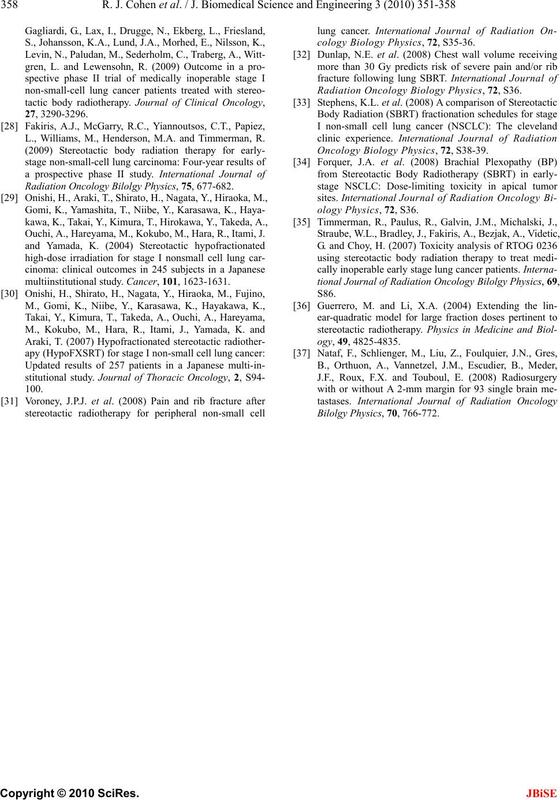 Radiotherapy and Oncology, 91, 314-324.
control. Statistics in Medicine, 17, 1103-1120.
esian-feasible dose escalation for cancer phase I trials. Statistics & probability letters, 38, 215-220.
phase II study. 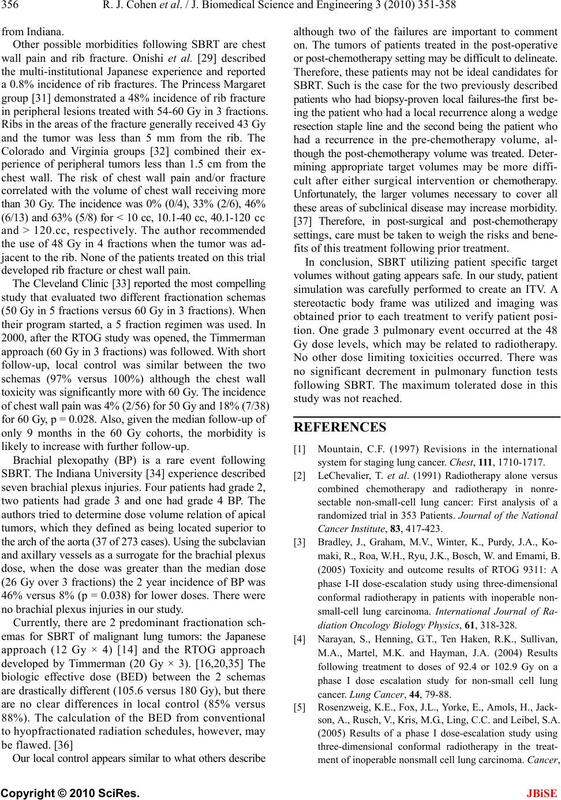 Radiotherapy and Oncology, 88, 359-367. L., Williams, M., Henderson, M.A. 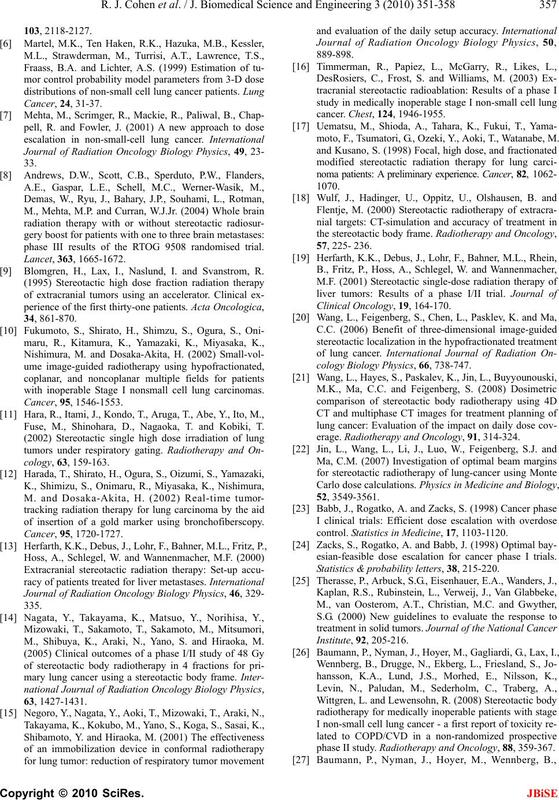 and Timmerman, R.
Radiation Oncology Bilolgy Physics, 75, 677-682. Ouchi, A., Hareyama, M., Kokubo, M., Hara, R., Itami, J.
multiinstitutional study. Cancer, 101, 1623-1631.
cology Biology Physics, 72, S35-36. Radiation Oncology Biology Physics, 72, S36. Oncology Biology Physics, 72, S38-39.